← Room fantastic — and the sequel is, too! The global box office ain’t big enough for the both of them. In 2016, the showdown between Warner Bros. and DC and Disney and Marvel will begin in earnest, and things had already started to come to a head in 2014. Batman vs. Superman: Dawn of Justice, seen as the early headstone of DC’s cinematic universe, pushed its release almost a full year from July 2015 to May 6, 2016, “to realize fully their vision, given the complex visual nature of the story.” Marvel, which started announcing release dates even before scripts were completed early in its production history, had already claimed that weekend, and they didn’t budge, announcing in April that Captain America: Civil War would hit theaters that weekend after a titanic performance from Captain America: The Winter Soldier. After a few months of talking about how Warner Bros. would get slaughtered if it didn’t step off, the studio pushed their date forward to March 25 after Marvel shocked everyone later in the summer with Guardians of the Galaxy, a virtually unknown property that opened within a few million dollars of The Winter Soldier and went on to outgross it on the year. Everyone in their right mind knew Warner Bros. was going to back down, but what we didn’t know until the Civil War trailer dropped just before Thanksgiving was this — Marvel isn’t going to let them back down. There’s a lot in this trailer to nerd out about, but cinematically, its most striking aspect is the visual gloominess. Three different scenes, which look to have three completely different settings, are in grey, depressing sanctums. The ocean’s blue is muted in one shot, and the shot of Tony Stark (Robert Downey, Jr.) holding a seemingly dead James Rhodes (Don Cheadle) takes place in a field with similarly muted grass under a blurry, grey sky. Even the glorious, hot rod red of Stark’s armor seems dulled. This could go down as the cheekiest stylistic decision in cinematic history. Marvel has developed a reputation for changing up its style with each new film, but DC has developed just as strong a reputation for turning each of their movies into a dull, grey mess because that’s what they think people liked about The Dark Knight, which actually wasn’t all that grey. Now, Marvel is changing up its style for this next movie to the style that DC has been using for all of its movies. But at the same time, they don’t. For seven years, Marvel has produced hit after hit after smash hit, and Civil War looks like the darkest hour for the characters we’ve been watching that whole time. And for the same seven years, DC has been trying to recreate its seminal work and produced flop after critical flop chasing that dream. Warner Bros. backed off the May date because it knew the DC cinematic universe would be throttled before it even got started if it released Dawn of Justice against Civil War. Someone at Marvel really liked that idea, and they’re trying to make it happen anyway. Even a month and a half a part, the showdown is still on. 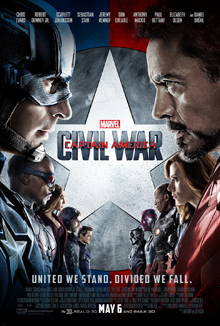 Captain America: Civil War will release May 6. This entry was posted in Applying Chaos Theory and tagged #Batfleck, #Batman, #batman vs superman, #civil war, #Dawn of Justice, #DC, #Disney, #iron man, #man of steel, #superman, #the dark knight, #warner bros., Captain America, Guardians of the Galaxy, Marvel. Bookmark the permalink.